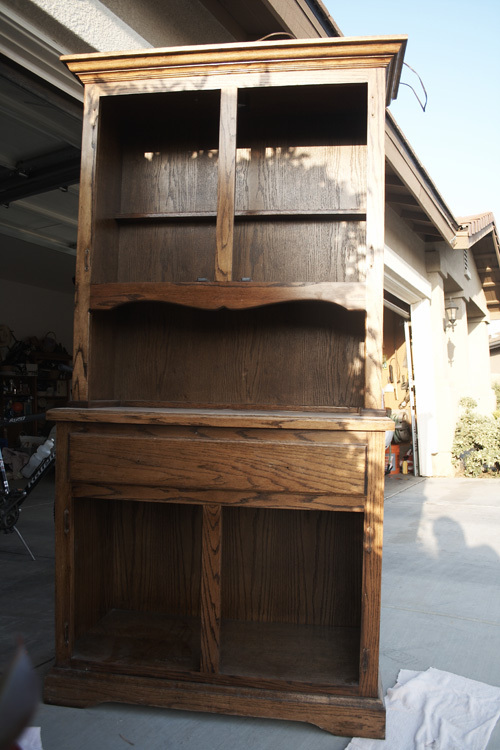 Whitney and I bought a hutch from a skinny man in Victorville. We decided to give it a makeover. Here is our new hutch anxiously awaiting its new look. I decided to post the progress of the transformation. If anything, posting the progress will encourage us to finish it sooner. Ever since I heard of this "hutch" I have been wondering, "is it a big hutch" "is it a small hutch" "is it a wide hutch" or "is it a skinny hutch" and now my wondering can be put to rest. Thank You Jon!! yes it's big and wide. not to be confused with deep and wide, the popular children's church song. keep in mind i took the cabinet doors off of it as well and the decorative windows on the top half. prepare to be amazed at the re-model.